Action ended 11:32:26: StartServices. Return value 1. Action ended 11:33:17: CA_CoreProductGetWebsiteExists. Return value 3. MSI (s) (14:CC) [11:33:17:443]: No System Restore sequence number for this installation. Action ended 11:33:17: INSTALL. Return value 3. 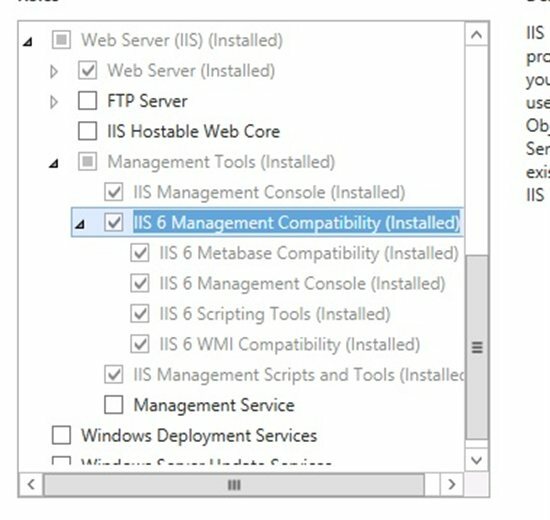 Microsoft Internet Information Services (IIS) with ASP.NET must be installed on the server. IIS must be configured with Windows Authentication enabled. If BHOLD Core is being installed on Windows Server 2008 R2 or Windows Server 2012, IIS 6 Management Compatibility must be installed. 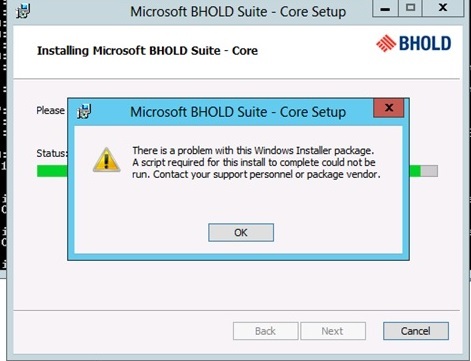 If BHOLD Core is being installed on Windows Server 2012, IIS 6 Scripting tools must be installed. Add these components(no reboot required) and ran install again, it succeeded.